Icom IC-M422 Fixed Mount VHF Radios are packed with features in a compact and stylish design. All radios feature a built-in DSC watch function that monitors channel 70 (designated DSC channel) activity, even while on another channel. In an emergency situation, a formatted distress call can be sent at the touch of a button. The smartest way to use a second station with the IC-M503...COMMANDMIC. front panel provides large function switches and a wide LCD. fits in your palm comfortably. postion data and universal/local times can be displayed. 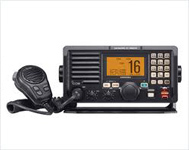 The I com M504 fixed mount marine VHF radio features Class D DSC and the capability to have a powerful 25W hailer at an affordable price. 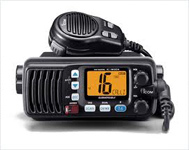 With features like a channel tuning knob and large built in speaker; as well as being built to IPX8 Waterproof specs, the IC-M504 is the right radio for your boat. 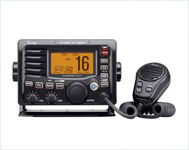 The IC-M504 offers a large 168 character, dot matrix, LCD display for easy viewing even in rough seas. 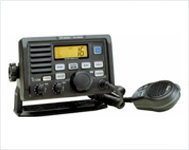 ICOM IC-M604 The Ultimate Marine VHF Mobile Radio. The Icom IC-M604 delivers a multitude of functionality providing better audio clarity, receive specifications, and hailing capabilities. 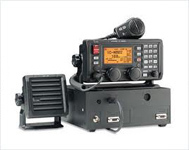 The IC-M604 is ideal for Commercial, Industrial and Public Safety Maritime markets.